Yuni Sameshima is the co-founder and CEO of Chicory, a technology company based in NYC that makes recipes shoppable and uses artificial intelligence (AI) to create distributed digital grocery shopping experiences. Today, their clients and partners include Time Inc., Peapod, Ritz and many more. Today, Chicory reaches over 70 million unique viewers per month. 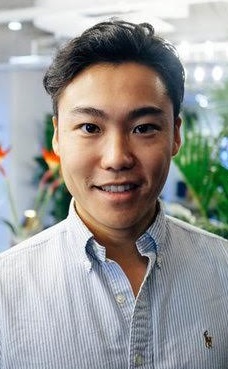 Prior to founding Chicory, Yuni worked in the food and venture space at Chobani and ff Venture Capital. He graduated from Colgate University with a Bachelor of Arts in Molecular Biology. My co-founder and I have always liked cooking. Dinnertime has always been important for our families and food has always been a part of our story. Separately, we each realized that there was an opening in the marketplace. Yes, there were grocery delivery services and online recipes, but there wasn’t an easy or efficient way to connect the two. So that’s how we first entered into the grocery/technology industry. The rise of ecommerce in grocery has been one of the biggest trends we’ve seen. Over the past year and a half, we created the largest shoppable recipe platform in the world, working with leading grocery partners. Meanwhile, we also saw an increase in demand from the grocery industry wanting to integrate technology into their businesses. Grocers and manufacturers are designing new initiatives (and even dedicating entire, new departments) around how to embrace technologies like shoppable content or add-to-cart functionality. As with many industries, momentum is driven by large players making big investments. You see companies like Amazon or Walmart competing and then that trickles down to smaller retailers. Most would say, consumer adoption and a barrier to entry in terms of technology are two of the largest challenges for expanding ecommerce. But consumers can and will adopt new behaviors. What we view as the biggest challenge is how retailers and manufacturers will adopt this future. Grocery is a legacy industry with industry-specific processes and relationships that are hard to replicate online. The opportunity is the same, though. The more innovative players will shape the space for themselves and for consumers, and that’s very exciting. We first started Chicory purely for selfish reasons-- so we could easily and quickly get ingredients to recipes delivered to our doors. Like many people, we loved to cook but didn’t necessarily have the time to plan, prep and shop in advance. However, our company has evolved into so much more over the past few years. Now we work not only with consumers and online grocers, but also recipe publishers and leading brands to make shoppable recipe content that’s harmonious for all four parties. We want to eventually become the catalyst that helps the entire grocery industry shift to ecommerce by creating a seamless experience from start to finish, while keeping all of those parties in mind. We have already taken the recipe space by storm. We’re integrated into over a thousand different sites and millions of recipes, and get a total of 70MM+ monthly unique viewers on our “Get Ingredients” button. In the next year or so, we’re improving our core technology, building out our Sales force and talking with more grocers and manufacturers to come up new solutions to solve their needs. Our business, at a high level, is a three- sided marketplace with consumers, recipe publishers and retailers. We knew a big challenge was how to get critical mass on these different parts of the business, so when we first started the company we made a clear decision to grow out our publisher platform to get as many recipe partners as possible. We knew that once we had recipe partners, we could develop solutions that would benefit everyone in this ecosystem. This has been true beyond our wildest imagination and we have seen great success with our partnerships. With this tremendous asset under our belts, we now have a voice when we approach retailers with a clear-cut value proposition. I will be the first to admit that we were swept up in the whole “startup” bubble. We raised funding without a clear revenue model and looked to grow out our network. The most difficult moment in our business (thus far) was looking at our bank account and realizing that effectively managing runway with seven full-time employees was crucial to our success. It was really a turning point for my co-founder and me. We set out on a journey to generate enough revenue to sustain our growth while also developing a clear-cut budget and plan for our revenue, ensuring that we won’t reach that point again. Our ideal customer experience is one where someone who is looking to cook a meal, or just generally finds a recipe they like on one of our partner sites (which offer millions of diverse recipes) is able to then get all of the necessary ingredients delivered that same day so they can cook and feed themselves and their family. We really want to make it as simple as possible for a general consumer to transform into a home chef with just a few clicks of the mouse. I’ve found that motivation comes from goal setting and celebrating both your wins but also lessons learned. I also fundamentally believe that work can be, and should be fulfilling. It constitutes the majority of your life, so why not do something that is satisfying? It’s important to show your employees that they are contributing to something and when they see growth and positive change that makes work fun and motivating. Whether you are starting a company or innovating within a larger organization, knowledge is key. Knowing what you work on day to day is great, but being able to take a step back and really understand how and WHY things work the way they do is important. Having that type of knowledge makes it easier to get stuff done but also opens doors to new opportunities you may have overlooked before.